Earth Fare is one of the largest natural food retailers in the nation. When it came time to build a new facility in Chattanooga, TN, they wanted every aspect of it to be very green and efficient. AbsolutAire provided a 99.7% efficient, direct-fired, 100% outside air V-Series to serve the kitchen. 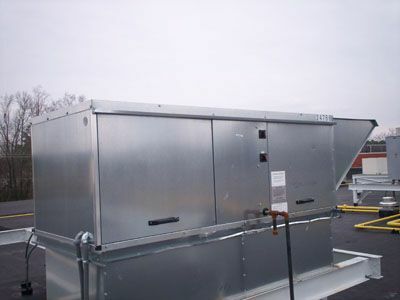 The unit incorporated VFD's for the supply and exhaust with temperature controls that allowed the unit to fluctuate with the volume of preparation work being done in the kitchen. If only half the kitchen was being utilized at any given time, the supply VFD would slow down the V-Series and operate only one exhaust fan, allowing the kitchen to use only the amount of energy it needed. As production levels in the kitchen increased, the second exhaust fan would energize and the V-Series would ramp up to high speed to allow the proper amount of heated air to enter the facility.